The Toys R Us Black Friday sale and Thanksgiving week deals were announced Tuesday, with some bargains available to loyalty club members as early as Sunday, Nov. 23. Most Toys”R”Us stores, as well as Toys”R”Us/Babies”R”Us combo stores, will open on Thanksgiving, with Babies”R”Us single stores closed Thanksgiving and opening early on Black Friday. 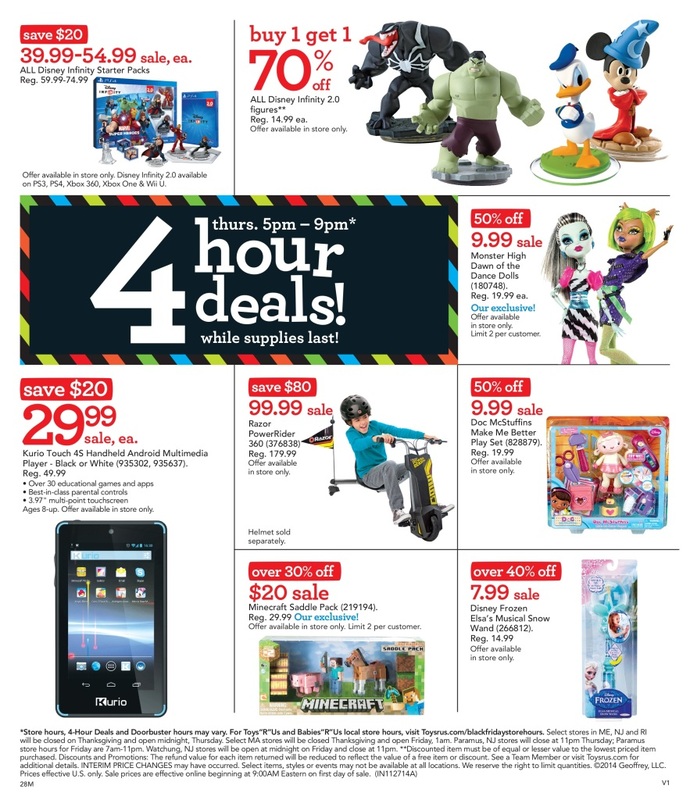 Following is a partial list of Toys”R”Us doorbuster deals available in stores nationwide on Thanksgiving Day, Nov. 27, from 5 p.m. to 9 p.m. or while supplies last with no rainchecks. Disney Infinity Starter Packs, $39.99 (regularly $59.99 to $74.99). Polaroid 7″ tablet computer with Android 4.4 KitKat, $39.99 (regularly $79.99). Vtech InnoTab 3S Connect, $39.99 (regularly $79.99). Barbie Sisters’ Horse Adventure Playset, $39.99 (exclusive, regularly $79.99). Disney Frozen Jumbo Olaf Plush, $19.99 (regularly $29.99). Monster High Dawn of the Dance dolls, $9.99 (50 percent off). Disney Frozen Elsa’s Musical Snow Wand, $7.99 (regularly $14.99). Minecraft Saddle Pack, $20 (exclusive, regularly $30). Kurio Touch 4S handheld Android multimedia player, $29.99 (regularly $49.99). Doc McStuffins Make Me Better playset, $9.99 (50 percent off). Razor Power Rider 360, $99.99 (regularly $179.99). Following are some of the items slated to be available starting Thursday, Nov. 27 and ending Saturday, Nov. 29 at midnight, or while supplies last, with no rainchecks. Customers can also purchase many of these items online as early as 10 p.m. on Wednesday, Nov 26. Select DVD and Blu-Ray movies, buy one, get one for $1. Crayola Super Art color kit and craft kit or fabulous art kit, $5.99 (exclusive, regularly $14.99). All Disney Treasury books, $5.99 (regularly $14.99). The following deals are among the more than 100 sale items available starting Sunday, Nov. 23, to Rewards”R”Us loyalty club members, who can purchase them online or in-store, while supplies last, with no rainchecks available. Loyalty cardholders also can earn points on their purchases, which they can apply toward later shopping trips. Fisher Price medical kits, $7.49 (regularly $14.99). Leapfrog Explorer and LeapPad software, $15 (regularly $24.99). All Disney Infinity video games, figures, playsets and accessories, buy one, get one for 40 percent off. Disney Frozen Anna’s Frozen Adventure playset or singing and talking Elsa and Anna two-pack, $29.99 (regularly $49.99). Kurio 7S Android tablet, $49.99 (regularly $99.99). Camelio II 7″ Android tablet with bonus accessory kit, discounted $10. Polaroid 9″ dual-core tablet, $59.99 (regularly $99.99). Skylanders Trap Team starter packs, $49.99 (regularly $64.99 to $74.99). Play-Doh four-pack, $1 (regularly $3.99). Apple iPod Touch 16 GB 5th generation, $149.99 (save $50). Power Rangers Super MegaForce Deluxe Morpher with 20 Ranger Keys, $34.99 (exclusive, 50 percent off). 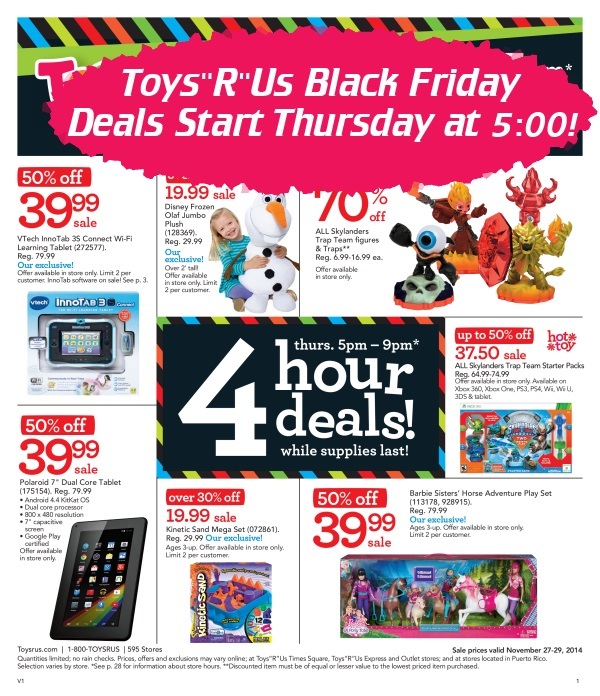 “R”Us credit card holders can receive 10 percent off their Toys”R”Us and Babies”R”Us in-store purchases upon request throughout November and December on Thursdays, including Thanksgiving Day. Through Dec. 20, card holders can also save 10 percent on Saturdays. Some exclusions apply, and customers need to ask for the discount at the time of purchase. Toys”R”Us stores have been touting their new strategies to assist shoppers with their holiday gift buying, such as toy gurus for providing expert shopping advice, express checkout lanes for shoppers buying just one or two items and digital store maps to help people quickly navigate the toy aisles. The company also recently began offering free online layaway for the Christmas season, in addition to its store-based layaway, and waiving the usual $5 service fee. This lets customers create layaway orders online at Toysrus.com and Babiesrus.com and even make payments online or in-store. Customers can choose to pick up their orders at a local store or have them shipped, with orders of $49 or more shipping for free. In addition, Babies”R”Us is running a Baby’s First Christmas promotion, complete with special store events and a sweepstakes ending Nov. 26. New parents can enter to win a a $2,500 Babies“R”Us gift card, a year’s supply of Gerber baby food or a year’s worth of Huggies diapers. Flash Sale! Ancestry.com Memberships 50% Off!